I have just started a new company, 4D-EMR, providing free storage and access for medical records so this post is a bit of self-promotion. You are quietly sipping a Prosecco, gazing over the cliffs of Positano as the sun sets over the distant horizon of the Mediterranean Sea when your arm goes numb and a sharp pain shoots into your chest. No one wants to think about it but what do you do if you have a serious medical problem while on vacation in a foreign country? You think about all the horror stories from the politicians about waiting six months for emergency care. You remember, “Everyone wants to come to the US to be treated.” Shortly the pain subsides and you decide to wait until you get home to go to your doctor. This is not a good solution. Most likely you will worry about your health for the rest of the trip and perhaps cut the trip short. Understanding the system will help you navigate through some of the misconceptions. Italy has national health care. It also has private health care just like the US. The difference between the two is that with the private system you will live like royalty while in the hospital with your own suite, personal nurse and usually a sofa bed for your partner to sleep comfortably while staying with you. The national system, depending on the type of illness and treatment, may put you in a single room or in a room with six other people. The quality of care, that is what really matters, is excellent in both cases. The public system will not turn you away even if you are not Italian, you see, every human life has value. 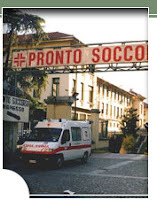 If you have an emergency, the best solution is to go to the Hospital Emergency Room, it is called “Pronto Soccorso”. If you have a stomachache or a sore foot you may want to ask the hotel for a doctor who speaks English. They will have a complete list of specialties and often can get you access to sports doctors for mobility injuries that somehow seem to happen while on vacation. The hospital will usually bill you at home at a later date. Doctors will usually want to be paid in cash. To avoid any unexpected money concerns, Europe Assistance will sell you a policy for a few bucks a day and this will cover everything from health emergencies to your car breaking down in the middle of nowhere and getting you to your destination. If you need to replace a medicine that you have lost or forgotten, go to any pharmacy, preferably have the hotel call beforehand. There are real pharmacists, Doctors with degrees in Medicine, in the pharmacy. 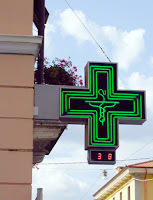 The pharmacy will have a lighted sign with a green and white or red and white cross. Every area will have at least one pharmacy open 24 hours. Outside of normal business hours you will pay an extra fee but they available. Most local residents will be able to tell you where the closest location of the “Farmacia di Turno” is, they may even accompany you there. It is always a good idea to have a list of any medications you are taking and any known health problems. Also the name and phone number of someone to contact in the case of emergency is a good thing. Your personal physician’s name and phone number could prove valuable. To sum it up, if you are not feeling well on vacation, do not tough it out. Medical care in Italy is excellent and may be the difference between a beautiful experience, eating great food, drinking marvelous wine while enjoying the sunsets and spending a week starring at the ceiling. Raffaella just read the article and added a quick, “Ti’e’, Ti’e’!” obviously with the appropriate hand gesture. This is not something one wants to think about when going on vacation but better safe than sorry. Farfallina Thank you. Hopefully we can match a good idea with a good business proposition! Dianne Thank you. The idea is not new just that everyone has forgotten that the patient should have some say in their treatment. The differentiating factor is that patients will actually have access to their records. Do you have any suggestions on travel to Italy for a 'medical vacation'? My fiance and I are getting married in a month, and she is interested in breast implants. I've read a bit about it, but would appreciate any info. Anthony - Unfortunately I do not have an inside track on this. I can say that most medical facilities are top notch.